Rasta Glass Sherlock unique design A beautifully crafted by newzenx workmanship with Gold and silver combination fumed and also decorate with bob morley rasta color rod strips, a unique design collectible gift for you everyone. 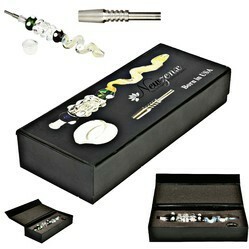 Contents: *Nectar Collector ZigZag 10"
As the name newzenx, a spoon pipes design looks like a special design. 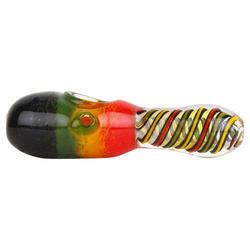 Spoon pipes come in a wide range of beautifully designed colors & sizes. 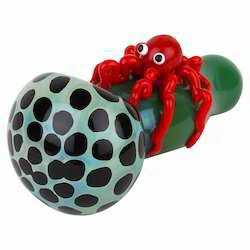 Choose your favorite one today from popular spoon pipe manufacturers who not complete the quality like Newzenx…if you need custom pieces we can be designed it beautifully with our workmanship, crafted to inspire of the products, this pipe made by borosilicate glass called pyrex with the green base color tube with Octopus design pipe. This is 5 Inch/ 12cm Glass Blunt Bubbler, Martian Smoking Bubbler Hookah Unique Design Smoking Hookah. 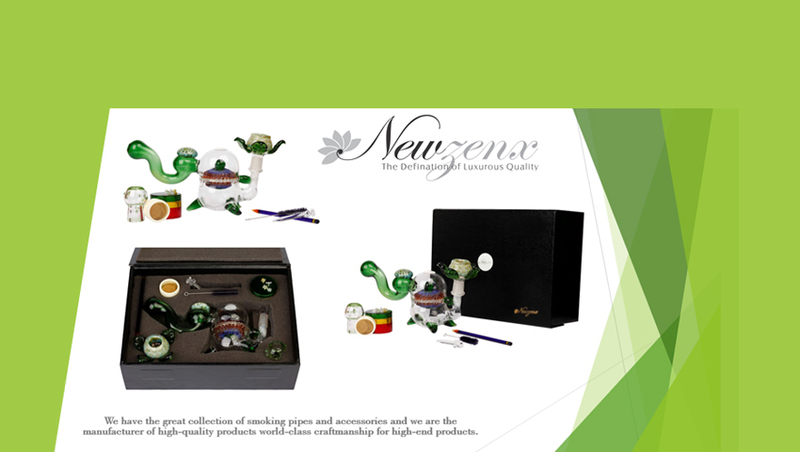 High-Quality Glass, Glass Polished Blunt bubbler, Export Quality. We are a New Delhi, India based manufacturer of the large variety of Unique Design Hookah and much new design smoking pipe, bubbler, water pipe, hookah manufacturer, and accessories. We are a 21 years old company. We produce our hookah Indian traditional design, glass pipe, the bubbler in house production and having experience of more than a decade. We export our pipes, hookah, tobacco pipe and accessories to more than 12 countries. Our glass hookah has the heavy wall thickness of high level of transparency. Each hookah finished with high-quality polish material to gives you a mirror like finish. Notice: Please allow 10mm difference due to manual measurement and slight chromatic aberration for different display setting. Also, allow +/- 200gm weight due to the manual making of each piece. Please kindly Note: Items will be repackaged to save your shipping charge & to be environmentally friendly. We guaranty the item will be protected well in the corrugated box. We promise to offer our customers the best of the product at moderate price,swift and timely delivery of products and high quality,we do all the process under one roof. Manufacturing Unit We are having our own two manufacturing units. Situated nawada industrial area & buradi industrial area, new delhi. Having a production capacity 05 tons of glass, wood, stone, metal, ceramic and acrylic smoking handicrafts goods per month. We at Ajay Industries India strongly believe in making as well as maintaining long terms relations with the buyer by maintaining quality and delivery schedules of the goods manufactured. We are sending our Company profile alongwith the products Catalogue/Best presentation to you for your kind reference. Please acknowledge receipt of the same and please let us have an opportunity to serve your valued house with our quality goods. We will of course, be very happy to furnish any further information you may require. We assure you of our fullest co-operation in business always. 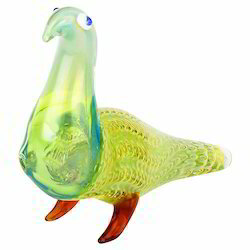 This is 4 Inch Tall Glass Tobacco Smoking Animal Pipe. High-Quality Glass, Transparent Gloss Finish, Export Quality. We are a New Delhi, India based manufacturer of the large variety of glass pipe and percolators, honeycomb, oil pipes, acrylic tobacco pipe, ceramic tobacco pipe, metal pipes, acrylic, metal, wooden grinders, and accessories. We are a 16 years old ISO 9001:2008 certified company.We produce our glass pipe in the house and having experience of more than a decade. We export our pipes, tobacco pipe and accessories to more than 12 countries. Our glass Glass pipe and water pipe has the heavy wall thickness of about 2.5mm and high level of transparency. Each water pipe finished with high-quality polish material to gives you a mirror like finish. Specification:100% Brand New and High quality, Eye catching and beautifulColor: White & Amber Material: GlassSize: 4"/10cm longWeight: 100gm approx. Notice: Please allow 10mm difference due to manual measurement and slight chromatic aberration for different display setting. Also, allow +/- 10gm weight due to the manual making of each piece. This wonderful Newzenx Bull design honeycomb glass pipe by Glass Craftmanship is rich in color and design. 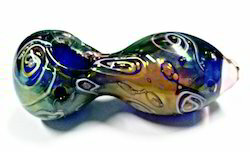 Using the silver fumed decorative glass blowing technique, the team at Newzenx have created numerous patterns all on the handmade crafted pipe. 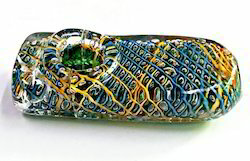 With a variety of patterns decorating the hand pipe, the design will hypnotize anybody taking a closer look. Coloured inside and out, it's unique glass pipes like this that make the Newzenx head, teeth, honeycomb, and bull face above their competitors, not make anyone this type of design. Created from only top quality borosilicate glass, this distinct hand pipe comes with the usual carb hole and a decently sized bowl. Notice: Please allow 10mm difference due to manual measurement and slight chromatic aberration for different display setting. Also, allow +/- 20 weight due the to the manual making of each piece. We are having our own two manufacturing units. Situated Nawada Industrial Area & Buradi Industrial Area, NEW DELHI. Having a production capacity 05 TONS Of Glass, Wood, Stone, Metal, Ceramic and Acrylic smoking handicrafts Goods per month. We at Ajay Industries India strongly believe in making as well as maintaining long terms relations with the buyer by maintaining quality and delivery schedules of the goods manufactured. We are sending our Company profile along with the products Catalogue/Best presentation to you for your kind reference. Please acknowledge receipt of the same and please let us have an opportunity to serve your valued house with our quality goods. We will of course, be very happy to furnish any further information you may require. We assure you of our fullest co-operation in business always.